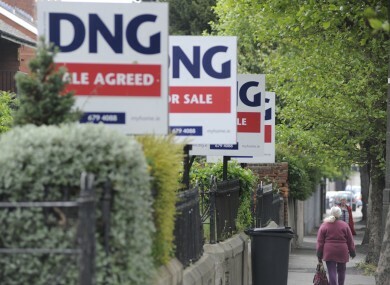 A research paper tries to examine why Irish house prices keep falling – and suggests the drop has gone too far. A NEW REPORT commissioned by the Central Bank of Ireland has suggested that the value of Irish homes has now “overcorrected” by between 12 and 26 per cent. The conclusion comes in a report written by Gerard Kennedy and Kieran McQuinn on the subject of why Irish house prices have continued to fall. The research suggests that a number of factors have come together to cause the continued fall in prices, though continuing low levels of consumer confidence have largely been responsible. “Investor conﬁdence, a key driver in a buoyant market, has been critically impaired and will likely take some time to recover,” the report suggests. Furthermore, the natural inclination for a ﬁnancial system to deleverage after a signiﬁcant credit bubble is compounded in the Irish market, where ﬁnancial institutions are obliged to reduce their balance sheets in order to achieve a more stable funding proﬁle. The report states that as of the third quarter of last year, the overall drop in Irish housing prices – at 44 per cent from their peak – was second only to the 1990s housing crisis in Japan, where prices had fallen by 49 per cent. CSO stats produced last week showed, however, that the average Irish residential property had now fallen by 49 per cent, the same level as seen in Japan during that time. Kennedy and McQuinn note, however, that Ireland’s housing collapse has been borne out significantly quicker than that of Japan: Irish house prices have now been in decline for 18 quarters, compared to Japan where prices fell for 82 consecutive quarters. “A growing array of evidence suggests that the difficulty in providing mortgage ﬁnance in the Irish market is having a contractionary impact on market activity and price levels,” they conclude. Email “Central Bank paper suggests house prices have 'over-corrected'”. Feedback on “Central Bank paper suggests house prices have 'over-corrected'”.